Five words come to mind to describe this artist and this record. Destructive, Black, Noise, Movies, Relentless and Hypnotizing. 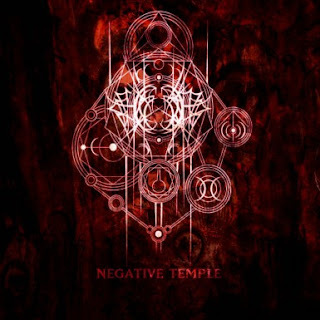 Nekrasov hails from Australia bringing forth his eight full length release entitled, “Negative Temple”. The name of the album is absolutely perfect and the artwork ties the rest of the energy here together so well. The album starts off with the title track which has great texture. It’s gritty yet not too abrasive, while also being a well constructed track. This would be great for a horror movie or suspense thriller. “Tears of Joy”, has amazing atmosphere while being constructed with very subdued noise. Low to mid range vocal singing the same consistent tone creates a unique cadence. It reminds me of a monk saying OM. This is quite meditative and cerebral. These tracks really bring to the fore front how genuine Nekrasov is with his sound and approach. The track leads into some more distorted frequencies that take you even further out on the plane of deep conscience thought. The tension keeps building until it finally dissipates at the end. “Hanging of the Shaman”, starts off with two minutes of silence. Almost sounds like you’re in some sort of windy cave or standing on the edge of a cliff with the wind gushing by. There are some gnarly fucked up reverse vocals that are super evil sounding. It’s like a shaman hung himself. So it starts with silence then goes into something that sounds like the in between of realities. At the end it becomes quiet again and then it’s as if you’ve finally reached Hell and you’re being welcomed with engulfing flames. The most negative song titles are the most relaxing. Interesting or on purpose or both? It seems to be more relaxed so as to pull the listeners psyche in harder towards the demonic cadences. Noise is a difficult style of music to produce. Although when done right, like here with Nekrasov’s Negative Temple. We can hear the importance as to why this sub genre is needed in black metal. Independent CD-R release limited to 50 copies.